Q: When optimizing scanned PDF documents, how can I keep the text quality so that the text is not blurry? A: You can optimize a PDF document by going to Document -> Optimizer -> Optimize. 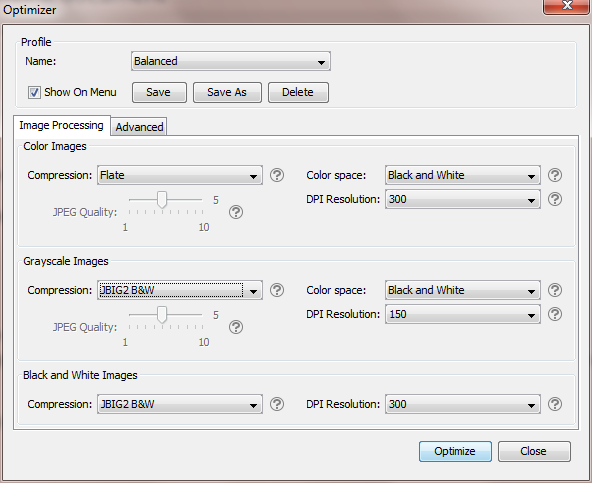 In the optimizer dialog, change the image compression to a lossless option such as FLATE or JBIG2 to keep the text quality. FLATE – Lossless compression does not reduce quality but may not always reduce file size. JBIG2 – Lossless compression that can only support black and white color space. Color images will be converted to black and white. This is the best option for scanned documents that contain only text and no pictures.